Who doesn’t remember the day they first experienced 3D through those strange “space goggles” with the red and blue lenses in a white cardboard frame? Well today, the same color coding of images, called stereoscopy, is bringing us even closer to magic, by merging visual art and computer science. With new broadcast television channels playing stereoscopic content, there is an increasing need for stereoscopic animated shows and commercials. That’s why Janro Imaging (JIL) - maker of the Optical Wand, a very unique “magic pen” that lets creators draw in the air without any tangible support - is working closely with four Mitacs-Accelerate interns from Concordia University: Andrew Ryan Blakney and Kaustubha Ashok Mendhurwar from the Department of Computer Science plus André Gilham Arnold (Software Engineering) and Audrey-Maude McDuff from the Department of Studio Arts under the supervision of professors Leila Sujir and Sudhir Mudur. "The initial research challenge of developing a novel commercial product required us to refine software, design prototypes, conduct trials, and use digital manufacturing techniques to build low-cost full-feature products," said intern and PhD candidate André Arnold, whose work can be seen in the illustration accompanying this story. For Paul Kroitor, President of Montreal-based JIL, "Mitacs-Accelerate is allowing our company to create an off-the-shelf and user-friendly tool that will allow artists to add 3D layers to their work in spatial drawing applications. We hope that it eventually become an industry-standard stereoscopic 3D animation tool." The high-performance tool will also be used for television productions and commercials. 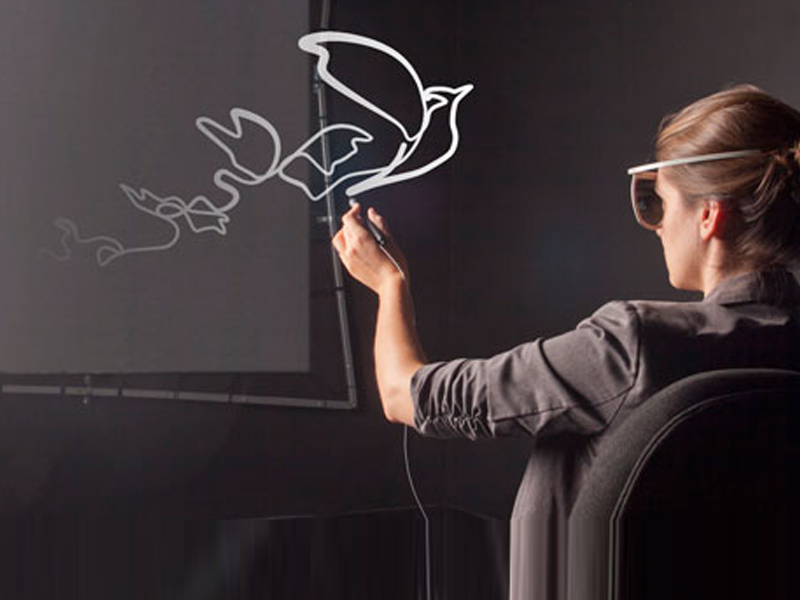 “Mitacs-Accelerate is letting us push our dream even further, allowing artists to work intuitively by literally drawing in 3D in thin air!” says Sudhir Mudur, Professor and Chair of the Computer Science and Software Engineering Department at Concordia University. And as for André, he has this advice to share with his fellow students: "The theories and research methods learned in school are valuable sources of innovation if used expediently in practice." With that frame of mind, there is no doubt that he will be very successful in his career. Mitacs gratefully acknowledges the Networks of Centres of Excellence's Industrial Research and Development Internship program and the Government of Québec for their support of Mitacs-Accelerate in the province.